Citizens For Modern Transit » Ten Toes Express Kicks-Off the Fall of 2013 with an Architectural Tour of Lafayette Square! 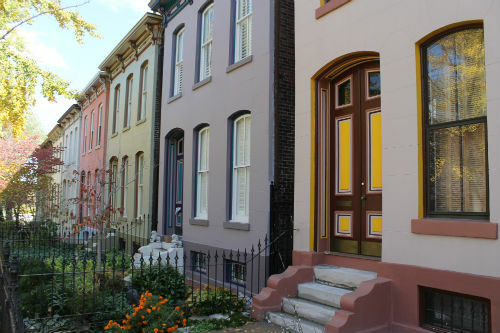 Home » Blog » General » Ten Toes Express Kicks-Off the Fall of 2013 with an Architectural Tour of Lafayette Square! Ten Toes Express Kicks-Off the Fall of 2013 with an Architectural Tour of Lafayette Square! Join us for the Fall 2013 Ten Toes Express Kick Off Walk, an architectural tour of Lafayette Square, on Friday, September 6 at 9 am. Mr. Bob Winters, AIA, is a principal with OWH, a full service architectural, planning, and interiors firm here in St. Louis and will lead the tour. This architectural tour will feature new park renovations, the grounds keeper’s house, French style revival influences on the houses ringing the park, highlights of the integration of new and old architecture, and will conclude at the business district where walkers will have the option to dine in one of the independent restaurants located in the Square’s thriving restaurant district. The meeting point for this walk/tour will be the Union Station MetroLink Station at 9:00 am. The group will then walk 1 mile to the Lafayette Square neighborhood, and another 1.5 miles around the square. Participants have the option of returning by bus or foot. You are required to be a registered Ten Toe Participant to attend the walk and Ten Toe Walkers should RSVP by writing info@cmt-stl.org or calling CMT at 314-231-7272. New Participants should use this link to register for the Ten Toe Express Program – http://tentoes.cmt-stl.org/TheTenToesExpressProgramRegistration/tabid/55/Default.aspx.